Happiness, pleasure, delight — these amazing birds of super blue carry the spirit of grace and joy where ever they go! Prosperity, good health, personal fulfillment and the gift of beauty and appreciation are all a part of the Bluebird’s spiritual pattern. To see or dream of this bird in any form indicates that all these wonderful energies are on their way to you! Placing the Bluebird image in your home in the East window at dawn on a waxing moon sets the stage to bring good fortune and happiness your way and encourages those energies to continuously flow into the family unit. Give your Bluebird of Happiness an offering of birdseed and water on the first day of each month to encourage you to remember to be appreciative of nature’s beauty! February’s Dreaming Bird embellishment choices draw in the joy and whimsy of creation! Feel free to add brightly colored feathers, glittery sequins, and shiny beads to your Bluebird of Happiness! Freezer Paper – to transfer your pattern easily to the felt – trace the pattern on the non-wax side of the paper. Cut out the pattern from the freezer paper. Use a warm iron to lightly affix the wax side of the pattern to the felt. Cut your shape out of the felt with sharp scissors. Magickal Items to Stuff Inside the Bird – I chose gemstones and herbs that have a general correspondence to family happiness, wishes, and good fortune for the household. Your Good Fortune Petition – I drew mine on a small, circular piece of paper that I stuffed inside the bird. You can put this herbal mix together yourself or you can purchase the BlueBird of Happiness Herbal offering in my store at http://www.whispermagick.com. Your herbs are sold with colorful cardstock label, a cotton conjuring bag and 4 BlueBird of Happiness soy candles. Would you like a different magickal formula? You might enjoy my new book, The Witching Hour! available at Llewellyn World Wide, Amazon, or your favorite magickal shoppe! Here is the pattern for BlueBird of Happiness! 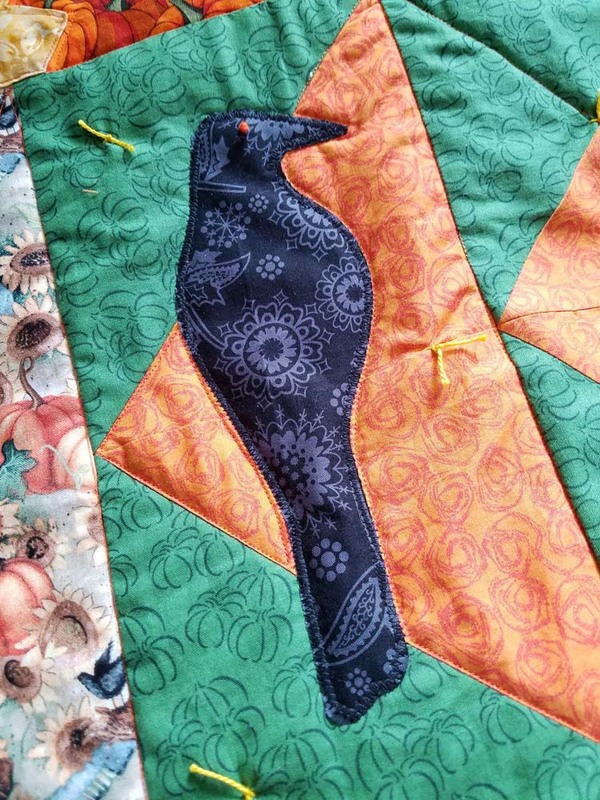 Remember to cut two of each bird pattern piece. If you don’t want the beak separate, just extend your pattern. I stitched the lines on the tail first to hold the two tail pieces together, then glued the tail as one piece onto the inside of one of the body pieces. When I put dolls and spirit animals together I always contemplate the easiest way to put all the pieces together — sort of like a 3-D puzzle! To keep the wings aligned on both sides of the bird I cut the wing out of the body pattern. This way, I just pin the wing over the hole and remove the pattern. BlueBird of Happiness will make a great Valentine’s Day gift in itself, or use as an embellishment on a present for a special loved one. I hope you enjoyed February’s Dreaming Bird! Next month? Crow/Raven!